When I briefly explained the story below to a friend he asked if I knew “how to travel with a salmon.” No, I said; it’s a book by Umberto Eco, he said, you should read the chapter about writing an introduction to an art catalogue. I did; and discovered a ‘uselessness’ to writing about art; a ‘uselessness’ based on the time of one’s life, or rather the ideas of note (or fashion) at the time of one’s life when one is writing about the particular art (a review or an essay); a ‘uselessness’ in time and over time, as time holds dear its own time; or, a ‘uselessness’ based on tense and clever proposals of meaning. Writings are works in miniature; like drawings on a page, they have a formal order to them in the formal dimensions of the book or magazine. They could be all the same; they ‘look’ all the same. Their differences, their energy and their composition lie internal to their look; it’s in their way of saying what they say that one can sense the writer and their world, the singular person writing. Interpretation (in writing) is useless too, although there is always interpretation. It’s the thing that remains, when all is said-and-done; the description of the thing, the ‘thing’ as description; the emotional experience of looking at the thing-in-itself; the thing-in-itself being anything, not just art, or art-like, or isolated out, special, and displayed. That is, I think, that one can cut-into the thing, shift the thing (the meaning of the thing); the “passage from the felt to the perceived is activity, being-in-the-world as construction of Abshaetungen cut deliberately in the very flesh of the thing-in-itself” (Umberto Eco, “How to Write an Introduction to an Art Catalogue,” in How to Travel with A Salmon & Other Essays, Harcourt Brace & Company, Orlando, 1994). The thing is as it is; it is its own sense — and then there is everything else. I was relieved then (or less dejected) after reading Eco, about the rejection (the story below), as I’d written in close proximity to the work (and perhaps done little damage to the work), writing what I saw while looking at the work, and what I imagined while looking at the work, and about the space of the gallery where the work appeared — that is, the work’s appearance in space, precisely positioned, and acting upon and acted upon by that space. However, writing is never ‘the thing’ being written about; writing raises its own issues, internal, nebulous and additional to its communicative role; it follows thought for instance (and thought is primed and tempered and composed), and uses words with varied (and interpreted) meanings. Writing is influenced; and Eco’s message has a salty mocking tone; does Eco mean (seriously, that is) that writing about art is a cut into (and out of) the art-itself, into and out of the thing-in-itself, into and out of its own sense; that writing about art removes (deports, exiles) the art from itself? It was good to have the intention of the writing’s form, its investment in being a particular and tenuous voice/body, recognised; in other words, recognised for being writing that was ‘with’ its subject. Anyway, acknowledgements of one’s small contributions are rare, and gratefully accepted. It was a commissioned text about a significant exhibition/installation that was comprehensively rejected. The writing was assessed unsuitable from beginning to end. I had not observed the ‘house-style’; I should have, I was told, understood the ‘house-style’ from reading reviews previously published by the magazine; and, some writers diversify their writing to fit different commissions; as well, there were inconsistencies, contradictions, multiple entry points, multiple theoretical agendas, and the political issues were considered ‘a given.’ In fact, it was unredeemable; its ‘approach’ was fatal. I went to bed very early. I was overwhelmed by the magnitude of the text’s faults. I was embarrassed too, as the work I had written about was strong and considered and subtle and beautifully installed, and its concerns were of contemporary cultural relevance; it deserved to be written about. I was lucky to have read Katerina’s article shortly before reading the rejection. Suddenly I could reflect on what it was that RealTime had provided for me, as a writer; what sort of venue it was for writing compelled by the visual arts (and by other art forms, in my case, dance and theatre), and how it encouraged writing that engaged with work as if the work was ‘part’ of the world not ‘apart’ from the world. It believed in art, trusted art, had faith, which is probably why it allowed writing about the work to be personal, fluid, emotive and strange. Writing was not just information about the ‘work’ and ‘meaning,’ but ‘work’ itself. And what’s more, the ‘work’ emerged from someone who was singular and responsive, someone who had experienced something. In other words, inconsistency, or variation, of voice was core to the venture — the art of the publication. I imagine that my writing is not ‘glum’ or dour. I imagine that it is ‘light,’ kind, and mostly tenuous and undetermined (with tiny blue wings). I imagine my writing as a ‘community’; and as a community that starts (up) again, or stops and starts, takes a breath, as it goes; then takes another track, then another, slowly getting home (and praying the weather will hold); and, during this ‘following’ process, other writers offer (to the writing) insights that help it out. If I chose to rewrite the rejected text I was advised to introduce the “poetic language” gradually; I have no idea what this means. Firstly, I don’t set out to write “poetic language.” That is, “poetic language” is not a strategy or a desire of mine. Secondly, how does one write gradual “poetic language,” or gradual anything-else language — theoretical, philosophical, whimsical, ironic, funny, literary etc. There is a ‘general reader’ at large, somewhere, who is thought to need gradual introductions to notions such as “poetic language,” and therefore to what is held (and assumed incomprehensible) within “the poetic” relevant to the artwork or the garden or the landscape. There are questions of function that confuse me: does a reader read for ‘house-style’ or does a reader read to discover what is being said by the writer, or is a (general) reader only able to understand a writer’s writing if it is filtered by ‘house-style’; is the benefit (usefulness) something to do with excision or re-arrangement or modification — from one condition or presentation (of self, let’s say) to another (still it’s not the ‘thing’ pursued); therefore, what is ‘house-style,’ what does it do, what ‘good’ does it bring the reader or the writer? What is it (then) when ‘house-style’ is ‘not-a-house-style’; when it’s every voice for itself, for its own worth and vulnerability, in the same way that the performer/artist is their own voice for themselves (in public); their own body making their own work and showing that, being on-show for others to see (as that body); the writer, on their own (in a manner of speaking), stumbling along, looking this way and that, tripping, getting up, falling, laughing and so forth, says what they saw, in this strange abstract non-material material called language; it’s weird and demanding and often frantic. An overall unified effect in writing is an illusion. There is always a dim corner, a dead end, a broken window. Writing holds together by fine soft threads. For me, and once again it’s imagined, writing is a kind of building/assembling activity; and ‘poetry’ here is ‘making’ (as in the Greek ‘poiesis’: making a new thing). The text looks ‘overall’ on the page, but it’s word-by-word, thought-by-thought. 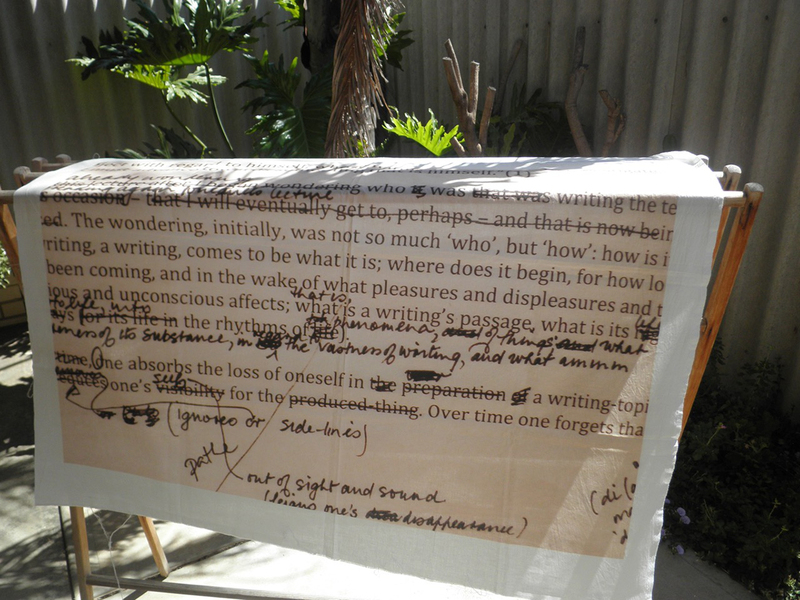 One comes upon, while writing, the writing; it’s prompted by, and emerges from, the encounter with the art. It’s not a neutral encounter; all types of memories kick in — from other art works, from books, conversations, wonderment, childhood, and so on (and from my dog or new rose bush). Reflection here is driven by age as much as event, and by what seems like dwindling opportunities for gatherings of voices; there’s demand for everything to be the same (bureaucratic forms, institutional agendas, party politics, fruit and vegetables: phrases, figures, slogans, accusations, sizes), to be of-a-kind, or understandable even (obvious, immediate, black-and-white, large, blemish-free). The world is layered and surprising and nuanced; sometimes it takes a long time to think about ‘things.’ There are minds of infinite kinds in all directions, yet writing is beaten into submission, into tortured ordinariness — as if its job is to transmit at speed an easy, painless, linear, ‘leap-off-the-page,’ doubtless message, and without ceremony. RealTime editors Keith Gallasch and Virginia Baxter are interested (and have been from the start) in how writers respond to, and express, the experience of being in the middle, or along the edge, of creative works as critics, participants, visitors, fans and fellow artists; and how they make connections to other art-forms of different yet resonant, textures and sensibilities — that is, how they make work (writing) as themselves (making writing a life-event, alongside the work being written about). They give/gave writers confidence to swing-out, rack their brains, be ridiculous, or reserved; writing could be enthusiastic, positive and supportive, on the side of art rather than at a remote (or discreet) distance; writing could be small, slow, meandering; it could get lost and emerge dishevelled yet still in the presence of the work (and with an uneasy inkling of something until then unknown (to oneself)). Each article in a publication can have an entirely different ‘approach’ — as do collections of poetry, essays or short stories. Readers of art-writing do not have special needs that require writing to be reined-in, or ‘gradual’, or noiseless (do they even know they are thought of this way; and I’m being a bit over-the-top, a bit graphic, but the ‘general reader’ might be me or you or our artist/writer colleagues). 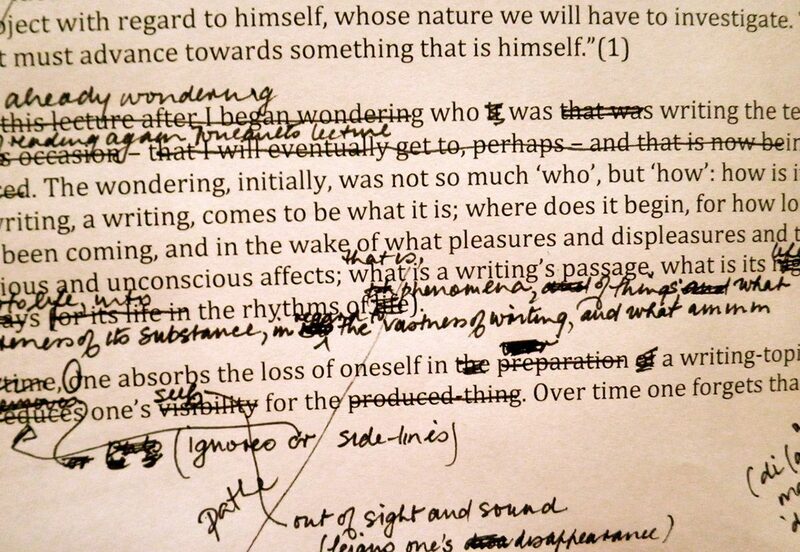 Editing is still necessary in terms of the text’s own character, in fact it’s ongoing, never finished, and valued; perhaps editing is charged with being open to unlikely possibilities and unfamiliar forms (after-all the natural world is pretty amazing, and crammed with extraordinary living structures, patterns and colours); perhaps a reader has to make adjustments to the voices as they shift from one writer to another (from speaker to speaker, as we do in the everyday), but that’s hardly gruelling (Eco’s essay “Editorial Revision,” on editing, is short and sweet). Reading might not then be such a smooth affair, or such an effortlessly consumed product; and might not give up, surrender, its subject without loose ends ­— it might have moments of pause or puzzlement. Although, and simultaneously, a noticeable framework is wonderful, a structure and/or a folly, that concentrates, focuses, and helps carry subtle insights and forensic dreams. Regardless, as readers we can be physical and flexible in reading, in being ‘at home’ in a field of differences, conscious of the ‘voice,’ and of other planets and creatures and perspectives (“surrounding spaces”); hearing and adapting to slight or sudden shifts, or broad sweeps, in words, sentences, and paragraphs, and trusting (or taking the chance with) links (or jump-cuts) between disparate references; ‘at home’ without the consolation of flattened-out idiosyncrasies and obsessions and plain old playfulness and joy. Writing is hard work, but it’s also fun and absorbing and worrisome; sometimes it comes as one-thing-after-another; sometimes further reading is necessary, and the views (counsel) of others come and go — not as revelations/opinions but as company for oneself, and as company for the ‘work/subject’ too. The written ‘work’ is a minor act on paper, a pack of good/bad cartwheels that never reach their full potential; nevertheless, they all belong (even when they collapse in a heap and disappear), these odd and jerky movements with glints of drama, mischief and darning. RealTime let me write as I could, which is an important point; it did not attempt to have me write another way: as I couldn’t. (It did not say to me: you’re no good at writing because you can’t write ‘properly.’) “As I could” and “as I couldn’t” are a little too bare and raw though; their opposition is not quite true, having written for academic publications with all their impossible criteria; and having studied for a journalism degree way back in the olden days, and having been a good student of literature, writing practices, and contemporary philosophy. Slowly, and, to more or less extent, without design, I came to an ‘approach’ (faulty and frail as that might be); an approach without formula or template — conditional, interdependent, circumstantial. ‘Overall’, writing is political. How it’s thought about by a publication, how its thoughts are enacted, is political; different engagements, experiments and observations, modestly accept the world as transient, fragile, composite, colourful, discordant and infinite. I’m not complaining about the rejection, I’m trying rather to dissolve the bodily (gut) feeling of shock or dismay (as one can stay silent for two reasons: accusations of thin-skin and sour-grapes); I did take it to heart though; and, it’s been difficult to read the text again as I’ve found myself chastising myself, reproachfully examining the relationship between my (rejected) ‘approach’ and my encounter with the work and with the artist’s practice over the longer term. I do though stand by the text in terms of its written-shape (and its relation to the work’s arrangement, sculpturally, in the gallery); the writing is something-in-itself, mildly textured, and made so as not to cut too deeply into the flesh of the work. (Susan Sontag wrote, and it’s salutary to be reminded to stay with the ‘image’: “leave the work of art alone”, “show…that it is what it is”, “(i)nterpretation makes art manageable” (Against Interpretation, Farrar, Strauss & Giroux, 1966).) It was, actually, rather understated, and ‘useless’ in terms of explaining (away) the ‘meaning’ of the artist’s work. But, as is always the case, a transformation takes place — from ‘work’ to ‘work’; writing can only be another work, literal and measured, a present-tense act, an invention, while appearing otherwise. The rejected writing about Aldo Iacobelli’s A Conversation with Jheronimus, titled “Strangeness is not so far away“, unexpectedly found a home on the Samstag Museum website. Another writer was commissioned to write about the exhibition by the same publication and her text too was comprehensively rejected. Linda Marie Walker is an Adelaide-based writer, artist and independent curator.